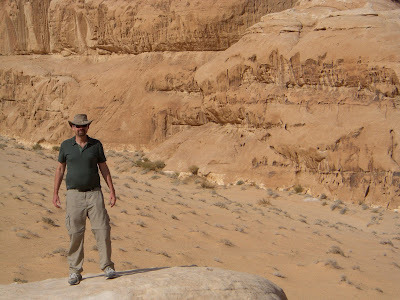 After tasting Israeli wines I made a detour to visit Wadi Rum in Jordan. My trip to Israel earlier this year was all about wine. When my article about Israeli wines finally appeared in Food & Wine magazine, it made me nostalgic about my first trip to Israel, 20 years ago. I had quit a great job as a newspaper sports columnist, sold all my stuff and was traveling around the world for a year, living out of a backpack. I hadn't planned to visit Israel. I had a round-the-world ticket on Pan Am (never got to spend the frequent-flier mileage), but Pan Am didn't fly to the Middle East. Besides, I'm not Jewish and all I knew about Israel was that Arabs threw rocks at soldiers who shot at them. Didn't seem like a good time. I was hanging out in Athens, having a bad time because all of Greece was on strike. Almost everything was closed, there was no public transit, and walking 10 miles to look at ruins before walking back again in 90 degree weather gets old fast. 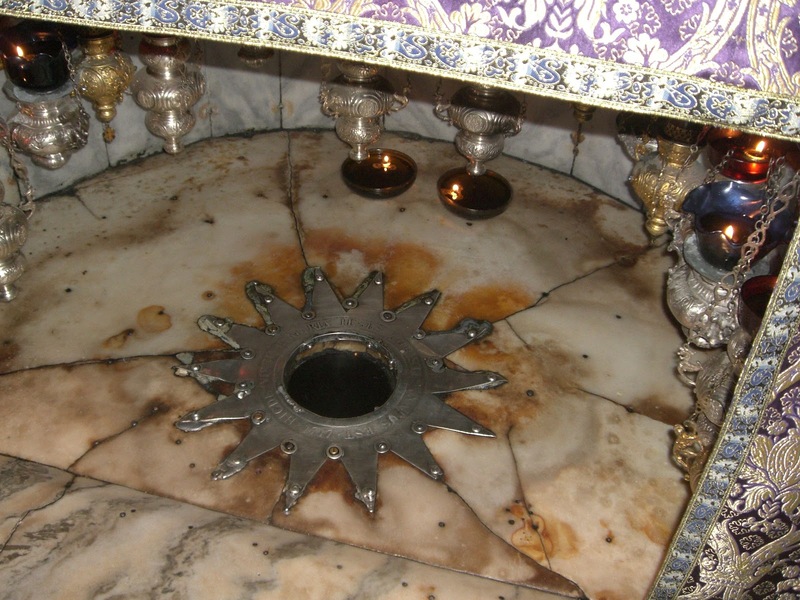 The star is supposed to mark the actual birthplace of Jesus. An Israeli in my hostel, Assaf, and I spent a long day walking to some ruins together. He insisted that if I was interested in history, ruins, culture, religion, basically anything at all, I should visit Israel. Jerusalem is the center of culture for Jews, Muslims and Christians. You can see the place Jesus was born, and where he died. What were Greek ruins compared to all that? He had a point, and backpack travel is all about flexibility. We lugged our backpacks to a ferry terminal and booked cheap tickets on the deck for a 3-day trip to Haifa. A lot of Israelis were on board; they shared their food with me, which was nice because all I brought was canned dolmades. A shiphand threw away my threadbare towel because he thought it was garbage, which is how I ended up traveling for the next few months with an official Israeli Army towel (no logo, which was just as well). I spent a week on a big industrial kibbutz called Yagur, which convinced me that Communism will never work because people there greedily hoarded even communal items which were not in short supply, like freshly harvested cucumbers. Most of the other kibbutz volunteers were 17-year-old Americans sent by their Jewish parents to have a life-changing religious experience, which they were doing by partying as loudly as they could in the dorms every night. I found myself defending the dorkiest of them from bullying and hanging out with the few other volunteers over 20. I had thought about spending a month on the kibbutz, but after a week I'd had enough. I moved into one of the greatest hostels I ever stayed in, in Jerusalem, for 10 shekels a night (this was $5 then), including endless tea, cheap white bread and jam for breakfast, and deep political conversation at any hour. Local college students would come in and take us on impromptu tours. I won't go into detail on the magnificence of Jerusalem, but Assaf was right: I've now been to more than 50 countries, and there is no more awe-inspiring city in the world. If you like to travel, you really need to visit. The Old City was tense in 1990 -- way more tense than on my visit this year. One of the two times in my life that I've lied about my nationality came when I turned a corner into what seemed like a dead end and suddenly Palestinians emerged from doorways. I was surrounded by more than 20 men, shorter than I, in dress shirts and ties and looking very serious. One stepped forward and said, "What country are you from?" I said, "I'm from Canada, eh?" (in my fright, I channeled Bob & Doug McKenzie) The leader said, "You must leave here now." They opened a pathway for me to walk away, and I did. 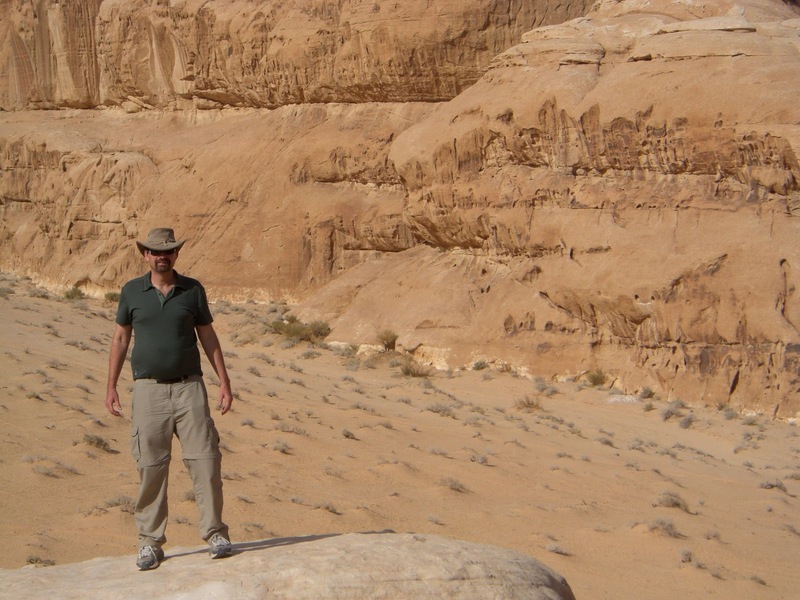 I spent about a week in Jerusalem and then decided to visit Egypt. A bus direct to Cairo cost $17 US, so off I went. I hated Cairo. The museums are great, with mummys piled floor-to-ceiling, even in the hallways. The pyramids and the Sphinx are awesome. But everything else is unpleasant. The food is lousy, the noise and traffic are unbearable, and everybody sees you as a giant leaky money bag. But often capitol cities are the worst part of a country (ever been to Jakarta?) I shared a pyramid tour with an American couple in my cheap hotel -- we were extorted by a camel driver, who refused to show us how to get off the foul-tempered camels until we paid up -- and we decided to see another part of Egypt. We picked Alexandria, known for being low-key. What a great decision. Alexandria has a fantastic history but no obvious tourist sites, so it's really off the beaten path. We rented the top floor of a 12-story hotel -- five bedrooms, three baths -- for $11 total per night, breakfast for three included. We had balconies on all four sides, and were close to the Mediterranean on the north. 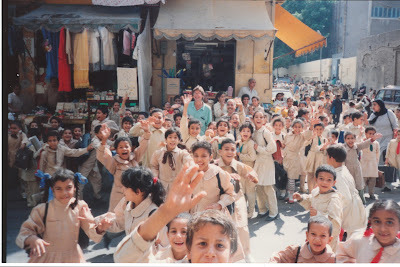 And the hotel people were so nice; they helped us visit wherever we wanted, and nobody had their palms out as they had in Cairo. Check out perhaps my favorite travel photo ever. That's me in the green shirt. An entire elementary school rushed to cheer for us when they heard three Americans were in town. 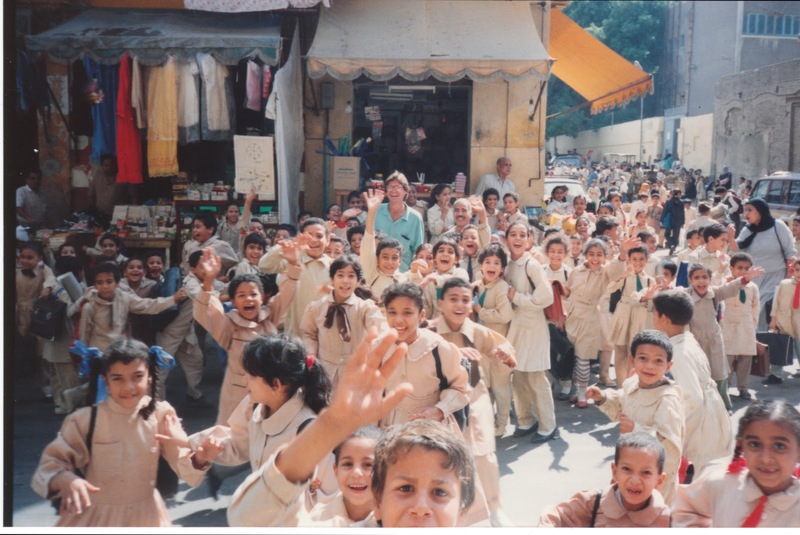 I daresay it's different now, but in 1990 Alexandria was a great place to be from the USA. We were sitting on the balcony at sunset and one of us observed that the only way Alexandria would be more perfect would be if we could get some booze, so we could enjoy a drink before dinner. Bad Egyptian beer is widely available in tourist districts in Cairo, but there aren't really any tourist districts in Alexandria. So we decided to ask the helpful people at the hotel. If they were disappointed in us, they hid it well. They told us to go to a nearby drugstore and ask. So we did. The druggist, when asked if we could buy some alcohol, immediately frowned. "Not here. You go around back. Around there," he said, pointing to a dark alley that in 2010 I probably wouldn't enter. He then shut the store door, closed the curtain and threw up a sign in Arabic that must have said "Closed," although I guess "Infidels around back" was also possible. He had a tiny window to the shop in the back alley. He asked, not pleasantly, what we wanted. We said, "What do you have?" He said, "I have alcohol. What do you want?" The couple got beer, but I said, "What else do you have?" which is how I ended up with a 750 ml bottle of brandy. The brandy wasn't very good, but three of us finished it easily. So we were back the next afternoon, and we got exactly the same treatment. This time I got orange liqueur, which was horrible. Awful. Imagine crushed-up orange-flavor kids' aspirin with booze in it. We drank it anyway. Did I ever claim I was a discerning drinker? Not in Alexandria at sunset. I wish I had seen some sort of product list. We stayed a week -- Alexandria was mellow, we were eating well, and man, that balcony with breakfast for less than $4 a day each was hard to beat. Every night we drank something different. The coffee liqueur was probably the least horrible. Only once did we get something so awful we couldn't choke it down; I thought it might be absinthe, but my American woman friend -- a nurse -- said she thought it might be paregoric. I lost contact with that couple; travel friendships are so intense, yet so short-lived. Earlier this year, I spent an afternoon with a guy I met at Kibbutz Yagur who found me on Facebook, and that was fantastic. He is the only person I've ever seen again from my visit to Israel and Egypt in 1990. But I think about that balcony and those sunsets and that horrible-tasting booze all the time. As a wine writer, I get a lot of free wines to sample. I drink only the ones I like, and pour the wines I don't like down the drain. Visiting friends are often shocked by this. They're used to drinking an open bottle whether they like it or not. But I don't have to, not now. Once in a while, after I've rejected a wine, somebody asks me, "Are there any circumstances under which you would drink this?" They expect me to say, "If I'm thirsty," or "If I'm on death row," or something like that. My answer is often, "If I were sitting on a balcony in Alexandria, Egypt at sunset, I would drink this. And it would taste fantastic." Nostalgia! Thanks for bringing back some wonderful memories from far too long ago. Great article.